April 12, 2019 – With early voting underway and less than a week until election day, the 2019 Alberta general election is still the United Conservative Party’s to lose, but the governing New Democratic Party has the momentum. 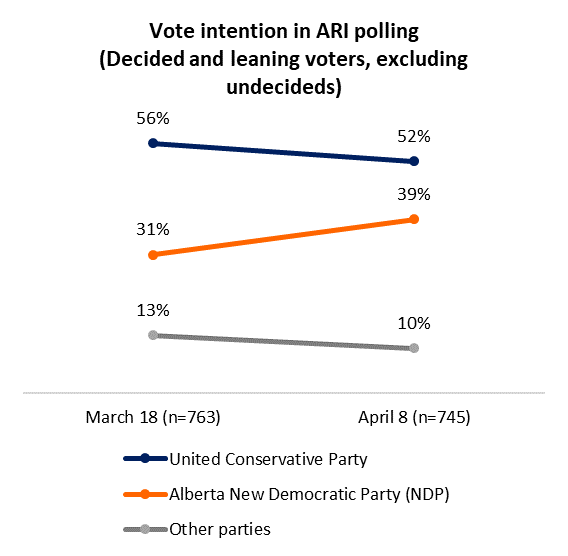 This, according to a new public opinion poll from the non-profit Angus Reid Institute, which finds the UCP lead has narrowed by about 12 percentage points since the beginning of the campaign. That said, Jason Kenney’s party still leads Rachel Notley’s NDP by 13 points. Underlying this shift are huge advantages for the NDP in Edmonton and among younger and more highly educated voters – especially women – while the UCP finds its strength among older voters and those with lower levels of formal schooling – especially men. With these trends in place, the question is whether this Alberta election will look more like 2012 – when the Wildrose Party held a polling lead throughout the campaign, but ultimately lost to the long-governing Progressive Conservatives – or 2015 – when Notley’s NDP converted its polling lead into a majority government, ending four decades of PC rule. Late campaign surges for governing parties are hardly unprecedented. In 2013, the BC Liberals trailed the opposition NDP for weeks leading up to election day, but the deficit shrunk from double digits at the start of the campaign, and it evaporated completely once vote intention became vote reality.